Raquel Orochena (right, in pink jacket) is honored at City Hall along with several other women by Mayor Eric Garcetti (far left) on Dec. 13, 2017, for Women’s Entrepreneurship Day in Los Angeles. Photo courtesy of Mayor’s Office. Raquel Orochena is most comfortable when she’s juggling a multitude of tasks. She’s a business owner, a management consultant, a mother of three daughters. And in May, she’ll complete the Master of Business Administration (MBA) program and graduate from California State University, Northridge. An immigrant from Nicaragua, Orochena started Orochena Construction Services with her husband, Roger Perez, in 2002. The company provides general construction, remodeling, and building and facility maintenance services for public agencies and private clients. 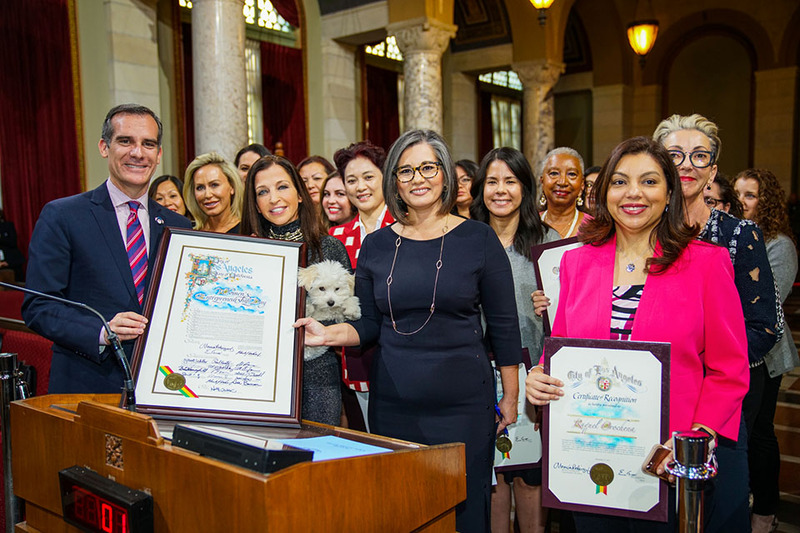 For her leadership and work as a woman and minority business owner, Mayor Eric Garcetti honored Orochena along with five other women on Dec. 13, proclaiming it Women’s Entrepreneurship Day in Los Angeles. The day’s honorees also included innovative entrepreneur Jane Wurwand, co-founder of the skincare company Dermalogica and The International Dermal Institute. Orochena said she felt thrilled to stand next to Wurwand and among the other women at City Hall. “I was very humbled and proud to be included in that group of inspiring women,” she said. Orochena emigrated with her parents from Nicaragua to the United States when she was 14 and just starting high school, in search of a better future. She graduated with high honors from Los Angeles High School and then UCLA, earning a bachelor’s degree in mechanical engineering. “I’m a product of great local, public universities,” she said. After college, Orochena went into management consulting for Accenture. The field appealed to her because it gave her the opportunity to work on diverse projects across many industries, she said. Recently, she decided to add consulting work back onto her plate, taking a job as a senior associate with management consulting firm Point B in downtown LA. Her husband, Roger (also an engineer), manages the day-to-day operations of their construction company, and Raquel continues to provide administrative management and oversight. The company is busier than ever, and during her MBA studies at CSUN’s David Nazarian College of Business and Economics, the firm was selected to remodel the CSUN Campus Store. Raquel was the project manager for the transformation of the space, which included new flooring, lighting, electrical and a snazzy, expanded Freudian Sip coffeehouse. In all of Orochena’s early professional work, her desire to learn more about business, management and finance — and pursue an MBA — persisted. At CSUN, Orochena jumped at the chance to work as a graduate research assistant with management professor Richard Moore, who manages a consulting group within the MBA program. “I wanted to work with [Moore] because he is a great mentor,” she said. “He gave me the opportunity to use my skills and experience working on his projects. He also inspired me to consider a teaching career in the future. Orochena represents what’s best in CSUN MBA students, Moore said. Orochena said she’s looking forward to completing her MBA at CSUN this spring, and eager to see where it takes her.